Anton Olaus Ness, later Anton Peter Ness, was the son of Peter (Peder) A. and Karen �Caroline� Johnson Baaken who were married at Arendahl, Minnesota, on March 20, 1872. Anton was their third of eight children: Lise Maline, John Andreas, Anna Ragnilda, Oscar Martineus, Realph Severin, Emelia Susanna, and Ludvik Realph. His mother passed away when Anton was 16 years old. Peder married Anna Marie Ericson of Granite Falls, Minnesota two years later. 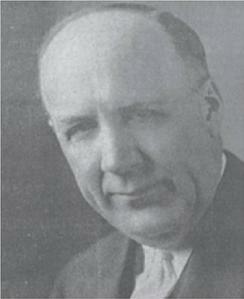 Anton Peter was educated in Clarkfield, and at the Willmar Seminary in Willmar, Minnesota. He lived in Vancouver, British Columbia, for a time while he worked in the real estate business. He also was associated with a Dr. Sheldrop of Minneapolis, and worked in Chicago for one winter. Anton P. Ness married Miss Elsie Caroline (Lena) Haugen at Tracy, Minnesota, on January 15, 1913. Elise was born in Tracy, January 23, 1886. In late 1915, or the spring of 1916, the couple moved to a farm west of McClusky, North Dakota. It was here that Anton began his faith healing. With the number of patients rising steadily who were coming to the farm seeking treatment, Ness established an office in the city of McClusky on November 8, 1918. Previously, neighbors had come to him for advice and relief. The number grew until Ness had no time for his farm. The family moved to the city August 1921, to the Boling House, because of the increasing number of patients coming to him for help. A newspaper clipping reports that in 1922, Ness charged $3.00 per treatment, and saw about 25 patients a day. By that time, the newspaper reported, Ness had held 20,000 sessions with patients. By 1930, about 125 people come to him each day for treatment. Before 1922, and again in the mid 1920s, Anton stopped charging fees and instead accepted donations if patients could afford to give. A typical business day began at 6 am, when Ness would appear and dispense cards on which the day and hour of appointment was written. It was common for people seeking treatment to sleep outside or in automobiles overnight in the summers, in order to be first in line the next morning to receive the card. For nearly his entire working career, Ness began work at 7 a.m., after handing out the cards at 6, and ended at around 6 p.m., with a bit of time off for lunch. In the fall of 1924, the family moved to Mandan, North Dakota, because of better railroad and hotel facilities, and because Ness would have more privacy when not treating patients. Another motivating factor was that the Commercial Club of Mandan had offered financial assistance, and several lawyers in Mandan had agreed to handle his business affairs, including R. C. Oliver. A newspaper article, �M�Clusky Miracle Man to Open Offices Here Tuesday,� from the Mandan Daily Pioneer, August 30, 1924, claims that Ness treated over 30,000 patients during his time in McClusky, between November 8, 1918, when he opened his office, and the fall of 1924 when the family moved to Mandan. The Ness family moved into the Harry Center residence on 5th Avenue NW, and the office was located at the Lewis and Clark hotel in rooms 239-241. Mrs. Ness served as his secretary. McClusky residents attempted to keep the Nesses from moving to Mandan, and a petition requesting the Nesses to relocate to the town of Mercer was delivered to the family, signed by 94 Mercer residents. As a healer, Ness made numerous trips to various cities and towns in Minnesota, North and South Dakota, and Montana. He had patients visiting him from the Midwest United States, the West Coast, and beyond. Although he was not licensed to practice medicine, the amount of testimonial letters sent to Ness from former patients revealed the significance of his place in North Dakota. Anton P. and Elise had eight children: Merle Paul, Carroll Peter, Evelyn Addie, Emil Ralph, Paul Haugen, Emil Anton, Eloise June, and Peter. The first born, Merle Paul Ness, was born in Tracy, on November 29, 1914, and tragically died in a car accident at age 16 in Valley City, North Dakota, on June 15, 1930. Carroll Peter Ness was born in Mercer, North Dakota, on November 2, 1916. Carroll P. grew up to be a farmer and owner of gas station. On November 28, 1949, Carroll married Ruth Lucille Olson (born in Rolette, North Dakota, on May 4, 1922) at Rolette, North Dakota. The couple lived in Clarkfield, and had four children: Merle Paul (born in Aberdeen, South Dakota, August 20, 1952), Steven Peter (born in Aberdeen June 10, 1955), Richard Bradley (born in Wagner, South Dakota January 14, 1958) and Charles Phillip (born in Montevideo, Minnesota on September 1, 1961). Evelyn Addie Ness was born in Mercer, North Dakota, on September 25, 1918. On December 19, 1937, she married Quintin Robert Roberts in McIntosh, South Dakota. Quintin was a car salesman, born in Aberdeen, South Dakota, December 31, 1900. Evelyn and Quintin had one child, Winnifred Elsie Roberts, who was born in Hollywood, California, on March 6, 1939. Quintin Roberts died at Mandan, February 28, 1940, from heart problems. On November 17, 1957 in Canby, Minnesota, Winnifred married Curtis Alden Severson, who worked in the public works discretion, and was born in Cottonwood Minnesota, November 29, 1938. The couple lived at Clarkfield, and had three children: Natalie Ann Severson (born in Montevideo, June 1, 1958), Connie Denise Severson (born in Montevideo, July 3, 1959) and Brent Curtis Severson (also born in Montevideo, on February 10, 1964). Evelyn Addie married a second time at Walnut Grove, Minnesota, on September 12, 1959, to John Wolfgang Bauman. Bauman was a gas station manager, who was born in Springfield, Minnesota, June 24, 1912. The couple lived at Walnut Grove, Minnesota. Emil Ralph Ness was born and died in Minneapolis, Minnesota, on September 25, 1920. Paul Haugen Ness was born in McClusky, North Dakota, on November 6, 1921. Paul was an insurance man, who married at Steelton, Pennsylvania, on September 7, 1946 to Ruth Lillian Essick (born in York, Pennsylvania, July 22, 1921). The couple lived at Dillsburg, Pennsylvania, and had three children: Anton Paul, Carol Ruth, and Marda Marie. Anton Paul Ness was born in Montevideo, on July 29, 1947. He was a corporate lawyer, who never married, and lived in Carlysle, Pennsylvania. Carol Ruth Ness was born in Harrisburg Pennsylvania, on January 14, 1950. She married Samuel Charles Brenize, a computer operator shift manager (born at Phillippi, West Virginia, December 22, 1944), at Wellsville, Pennsylvania on September 27, 1970. Carol and Samuel lived in York Springs, Pennsylvania, and had two children: Nicole Renee Brenize (born in Chambersburg, Pennsylvania, March 27, 1971), and Keith Charles Brenize (born in Harrisburg, September 29, 1973). Finally, Marda Marie Ness, the third child of Paul Haugen and Ruth Lillian, was born in Harrisburg, Pennsylvania, on September 7, 1958. Emil Anton Ness was born in Mandan, June 16, 1925, and passed away months later in Mandan on October 6, 1925. Eloise June Ness was born in Mandan, June 5, 1927. She married at Montevideo, July 1, 1951, to Spencer Odell Kvam. Kvam was a farmer, born at Montevideo, on August 29, 1924. The couple lived at Granite Falls and had three children: Spencer Henry Kvam (born in Montevideo, January 28, 1954), Karen Mari Kvam (born in Montevideo, March 20, 1955), and David Alan Kvam (born in Montevideo, March 7, 1957). Finally, Peter Ness was born in Mandan on September 25, 1928, and passed away that same day in Mandan. Anton P. Ness passed away on April 13, 1940, at his home in Mandan, North Dakota. His funeral was held on April 15 in Mandan at the Charles Wesley Burns Methodist Church, with Reverend A. R. Henry, Pastor, officiating. Following the Mandan services, the body was taken by train to Tracy, where another service was held on April 17, and Reverend I. O. Melom of Montevideo, officiated at the services. Ness was buried in Tracy.